This will be the last Charlie Chaplin movie I review for the 2014 Century Awards season. I saw every movie he made in 1914, but there just wasn’t time to review them all. I think all the serious contenders for awards are covered now, at least. Of the really early Keystone movies, this is probably the most classic “Little Tramp” short. 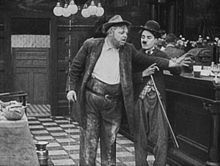 Charlie is doing his funny drunk bit at a bar, and engaging in slapstick with a variety of bar patrons including Roscoe “Fatty” Arbuckle. Outside the bar, he seems to be effectively charming a young lady (Peggy Pearce, also in “Tango Tangles” and “A Film Johnny”) with his silly antics, which include twirling his cane and manipulating his hat with it, until her father comes along and chases him off. Back inside the bar, he has a variety of pratfalls involving the swinging door to the bathroom, and then engages the entire clientele in a slapstick fight. He then follows the young woman home and drunkenly stumbles about the pace causing mayhem until he gets kicked out. Not really an admirable fellow, but definitely funny. The chemistry between Chaplin and Pearce was apparently real – she was the first of many leading ladies to be romantically involved with him for a time.